Sensing all odds against his party, congress leader Dr Y. S. Rajasekhar Reddy decides to take pada yatra across the state in a do or die battle. He begins the journey in Chevella in Ranga Reddy district and ends it in Ichchapuram in Srikakulam district. He meets cross sections of people, listens to them, sees their plight, and observes the conditions and notes down all of them. This journey changes everything Andhra Pradesh political scenario as well as his life. The film ends with him becoming CM and his death. 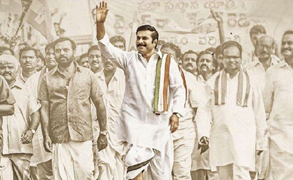 Making a biopic on Dr. Y. S. Rajasekhar Reddy aka YSR, one of the most popular and charismatic leaders of Andhra Pradesh ever, is a tough task for any director. YSR was not a movie star like NT Rama Rao, nor did he have major dramatic incidents in his personal life like the way NTR or Savitri faced (biopics on both these stars were released in the recent times). YSR did have his share of ups and downs in political life but they were not dramatic in nature. Hence, Mahi V Raghav focused on the most important phase of YSRs life, that not only changed the face of Andhra Pradesh but also made him a Mahaneta in AP political sphere. That is YSRs famous Pada Yatra. The director has tried to capture the spirit of YSRs relentless pursuit to make peoples life better. The film comes to the point straight way. Congress was facing big crisis. Even YSR had nil chances of attaining power if he didnt do something out of ordinary. In that sense, this film shows the opponent (Chandrababu Naidu) in realistic manner saying hes powerful. The film also shows that Naidu built IT infrastructure and Hitech city but neglected the farmers and the poor. Mahi V Raghav doesnt go beyond criticizing this point. He has stuck to YSRs pada yatra, how he had seen the plight of the people in his own eyes and how he had created schemes based on what he saw. Thus the director has focused on positive angle of YSR and has not used this platform to slam TDP and Naidu. He has also not made this film as a pamphlet for YS Jagans party. It is quite interesting to note that Mahi V Raghav made a political pada yatra into an emotional journey. He has elevated YSRs greatness by creating scenes like YSR having dinner at a poor womans house and knowing the pension problems. Scenes like YSR introspecting that they (political leaders) never cared for what people want but strived for what they want as leaders. Such honesty has made this film an honest effort. Expectedly, the film makes YSR as a supreme leader in Congress twisting some facts of then political life. That is understandable. However, Yatra doesnt go overboard in glorifying YSR but depicts the journey that he underwent as a person to become a great leader. Three scenes stand out in the film. YSR learning the importance of free medical treatment with a poor kids mother (played by Kalyani) trying to get money for the treatment for heart ailment. YSR going all out to defend a poor constable who did forgery to get Rs 35000 for education of his son. Asking his assistant to sit with him for lunch along with congress leaders. These three scenes have brought out the personality traits of YSR. The films laugh out loud scene is when Chandrababu Naidus voice is heard over a phone call. He says They briefed me on the phone. Naidu is never shown on the film but this voice brought the house down. Even though Naidus infamous dialogue they briefed me is used in a different context here, it brings laughter. Mahi V Raghav as a director has pulled off this biopic perfectly despite some problems in the second half. Overall, Yatra is a perfect tribute to YSRs life in general. The film will be liked by all YSRs fans and congress leaders. For general audiences, it makes a decent watch as it portrays an important political event in combined state of Andhra Pradesh. More than politics, the emotional sequences work out well for all. Note : This review is an opinion of review writer. Please do not judge the movie based on this review. After you watch movie in the theater, please let us know your feedback in comments below. We believe that movie making is a tedious job and needs lots of efforts in making. Hence we do not rate any movie. We keep it as our principle.